It’s hard to believe our harvesting time is nearly over, the only things remaining are tomatoes, a few beans, courgettes, a handful of carrots, beetroot round two and half a dozen red cabbages. Everything else has been brought in to be frozen (beans and brocolli), dried (onions) or pickled (first batch of beetroot). The allotment is no longer at it’s peak, and things are looking a little untidy. (Ever had a house party and gone downstairs the morning after to see the aftermath in the cold light of day? It’s just like that!) The string on the beanstalk wigwam has rotted away, giving the whole thing a slightly drunken tilt. 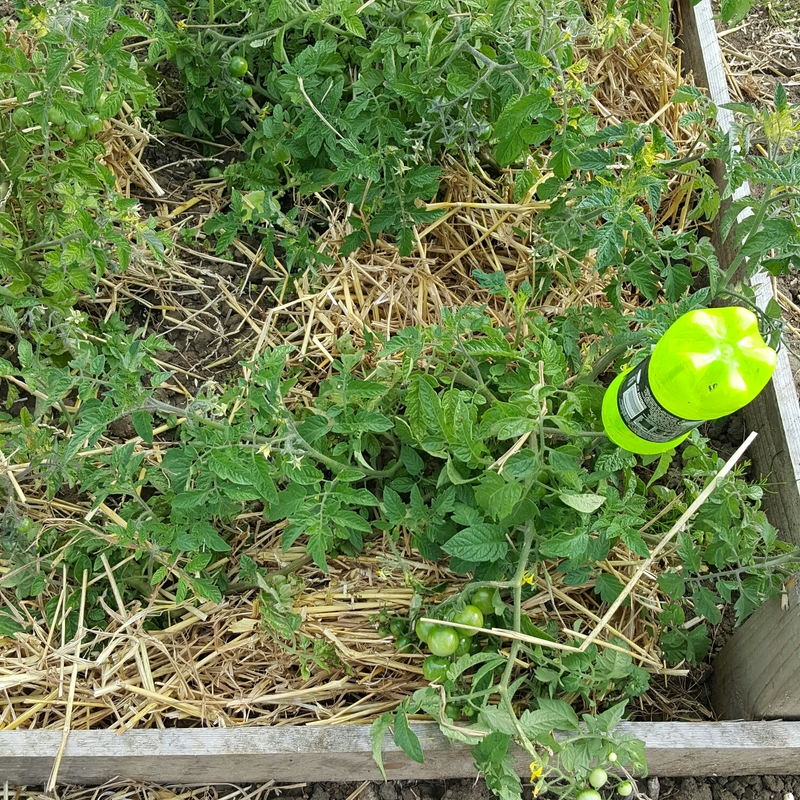 The tomatoes have had the stakes removed and are lying on straw beds, with some leaves removed so that the fruit can ripen in the late summer sun. (At this point I will confess I’m hoping they don’t ripen too much as I quite fancy making some chutney with the green ones!) Where the potatoes were, the ground just looks dry and barren now, with uneven heaps of soil. Sadly the potato harvest was not good; other things (slugs mainly) had got there first and had a good old munch. The chickens quite enjoyed the worst ones though so it wasn’t all bad. 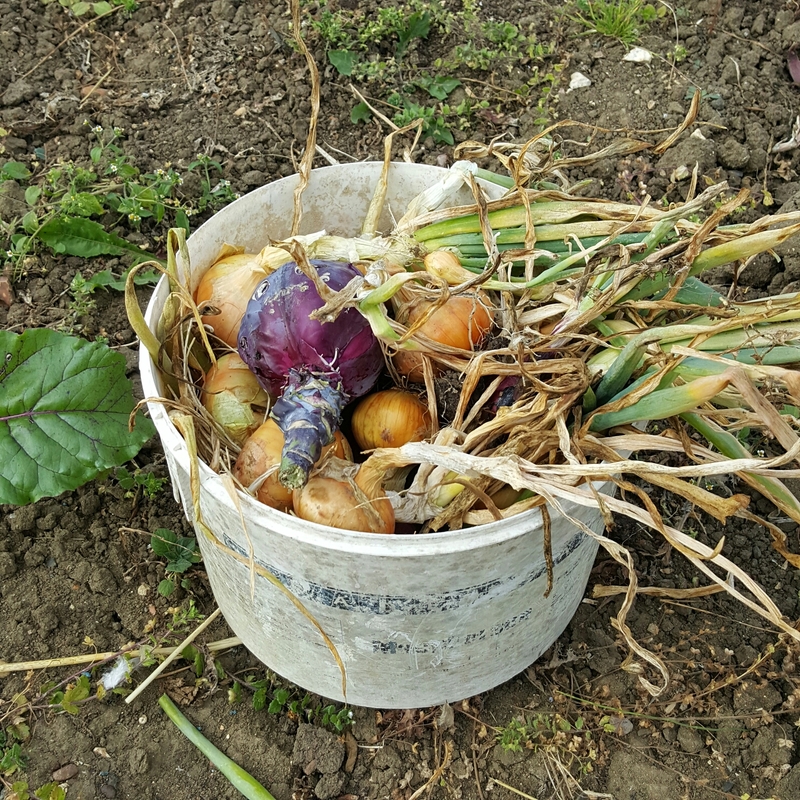 The rows of onions looked rather forlorn as the leaves had laid down and so we harvested them too, we gathered a whole bucket full and they are drying out at home, ready to be used through the autumn and winter. The brassica area, which had been netted off, looked unloved as we had removed individual plants to eat (again, the chickens benefited from the leaves and stalks, along with any grubs hiding amongst them). It seems to have gone by so quickly, this growing season of ours. Being amateurs, we had only really planted ‘common’ summer crops, so we will have nothing to work on through the late autumn and winter. 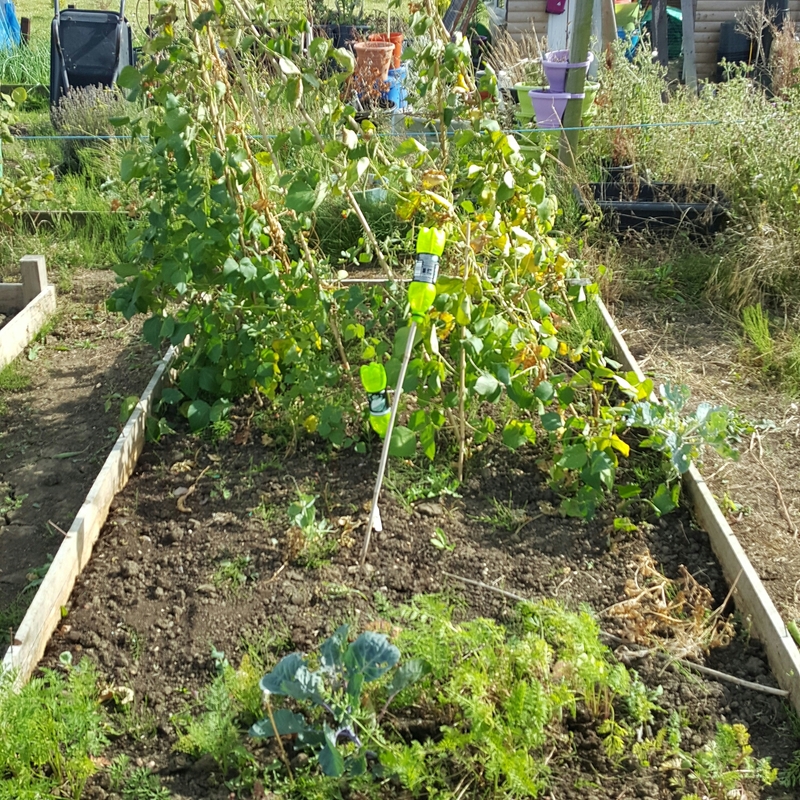 I have been taken by surprise at how short these months have seemed, and we are definitely going to look over our allotment books to find crops which we can grow to provide food for a longer part of the year. It’s almost sad, but the recent heavy rainfall will have benefited the heavy clay soil no end and Dave is hoping to rotavate the potato half, adding well rotted manure to add nutrients through the winter. There are other jobs we want to do there that aren’t directly related to the plants so hopefully we will have a warm autumn, allowing us to use our allotment time to prepare for next year. 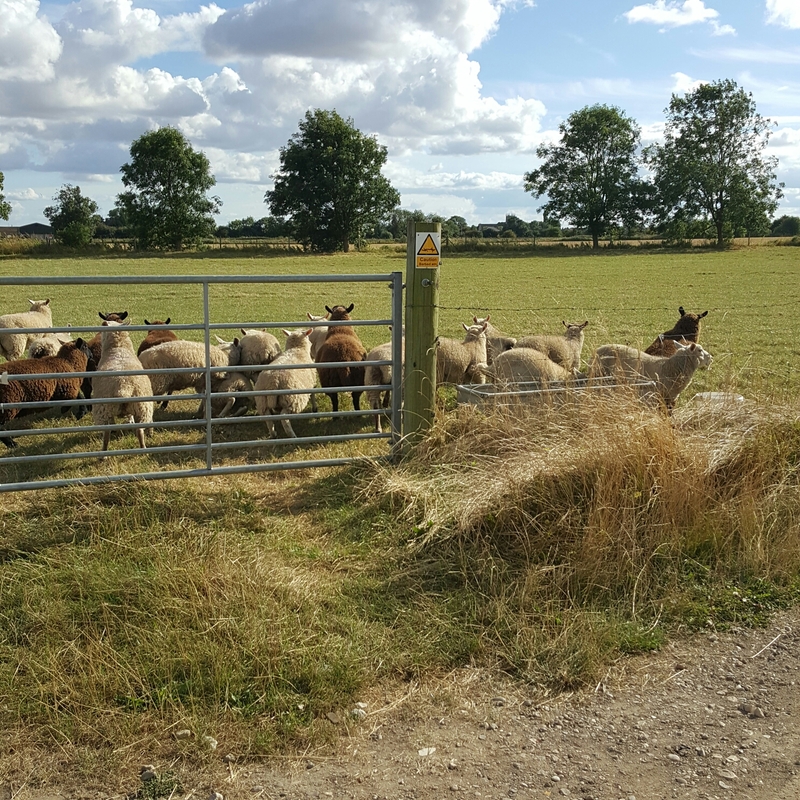 I’ll finish with this photo of the field at the end of the allotments, it has sheep in it again, just like last year when we first went there. It really is a peaceful place to spend time, and quite pretty too (in my humble opinion). Next Post Share your blog! Thank you, it’s a funny feeling isn’t it? I’m such a townie – it never occurred to me that you don’t get crops all year round!! Haha! I was brought up in the country but always thought of September as harvest time (I’ve followed a lot of tractors on my way to work!) and it was a bit if a shock. Looks like September will be allotment tidy up time instead, especially if the supply agency don’t get me much work! 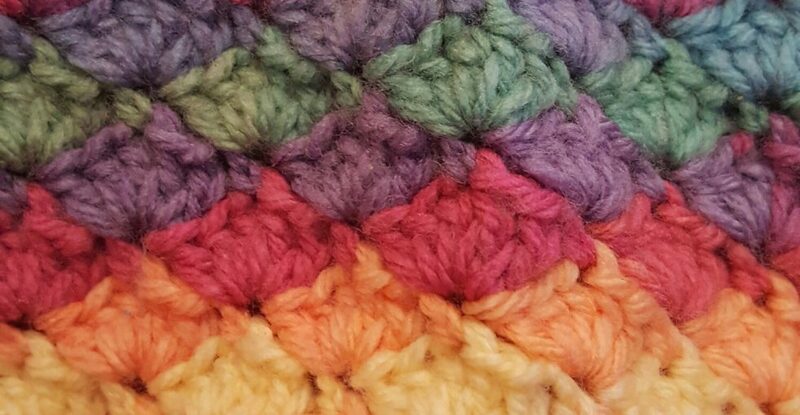 Looks like you’ve been busy, MrsCraft! Always good! I love these pictures. They make me even more aware that Fall is coming, which is my favorite time of the year. Thank you. We grew tomatoes at home two years ago and got a good crop from planting them in buckets! We.like autumn too, my 4 year old has got his eyes on all the conkers growing in the trees as there’s a whole row of them on our walk to church. I had to Google what a conker was. 😀 I love when the little ones are into the seasons too. My three year old is just now understanding that Halloween is coming, and she is so excited! I hope she’s as crazy for the Fall season as her crazy mommy. Thanks for the follow. I’m glad to know someone from rural area. My late mother used to love tending to plants and pets. Her brother has several vines and small plants in his house and if I got money, I’ll break down my old house and make space for some home-grown plants. Women fascinate me because they’re always up to something good. I am so in awe! I am trying my hand at growing food in the garden but, except for spuds, I’m not doing too well. Your allotment looks great. Well done! We had loads of tomatoes last year and I made green chutney and still have jars.. thankfully they have ripened better this year and we have had lots of takers when we have given them away.. Onions looking good .. ours didn’t fair well, rotten most of them so had to throw most away.. Thank you, the beetroot is now almost ready but I suspect the slugs may have helped themselves. We will see! The tomatoes have a few days left before we pick them and turn them into chutney.